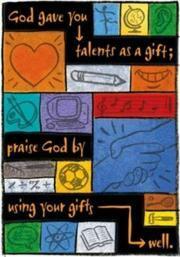 Do you have Spiritual Gifts? Do you know what they are? As 1 Corinthians 12:12 says "The body is a unit, though it is made up of many parts; and though all its parts are many, they form one body. So it is with Christ" (NIV). We should remember that we are put here on this earth for the purpose of bringing glory to Christ. This is done through the Spiritual Gifts God has given and equipped you with. We invite you to discover what your Spiritual Gifts are and desire for you to utilize those gifts at Cedar Grove Missionary Baptist Church. An easy website that can be used to determine those Gifts is www.buildingchurch.net. Once there click on Gifted2Serve on the right hand side of the page and follow the directions and then let us know what you discover!! !